Try to find 6 Food Network stars that *aren’t* annoying. I know it’s hard work and all… but come on, you can do it! So to amuse myself, and you, here’s my list of the 6 *Least* Annoying Food Network Stars. Or is it the 6 Most Likable Food Network Stars? It really is a love/hate thing. I’m sure you have your own list that’s completely different! The Season 2 winner of The Next Food Network Star with the spikey hair hosts what I think is the most enjoyable show on Food Network – Diners, Drive-ins and Dives. How can you NOT want to “go there” and try that food? And Marilyn and I constantly Google the locations to learn more about their history, menus etc. He’s first on this list of least annoying only because of the heavy jewelry, backwards shades (always?, really? ), and over the top persona. Otherwise, I love this guy, Guy! The red-headed “boy” from Brooklyn has become the “face” of FN since Emeril’s departure firing. We saw Bobby “live” in DC last year at the Metropolitan Food Show, and yup, he’s arrogant and pushy, but the “boy” knows his grill. And he loves ancho chiles. We also saw Paula Deen, but she’s on that “other” list! Tyler has some real solid recipes and he knows his stuff. He’s here because he’s so “vanilla”. But he is like… well, a brother teaching you how to cook things. He’s young, cool, artistic – hey, he makes cakes! And his staff is awesome. Extra points for being a Baltimore based local business. (Overlea, I miss ya since I was oh, 3 yrs old). The Barefoot Contessa – Awesome kitchen, house, neighborhood, and she had a funky little shop for awhile in a little place called The Hamptons. Shes very low key and is great on camera as a teacher. But (hey bloggers) scooting off to type about 2 sentences to “finish this recipe” or “finish this post”… not real life. In it’s day, Good Eats was ground breaking, solid entertainment that you learned from. Props, characters… kinda like Sesame Street for Adults what with the puppet-tongues and puppet-foods. The Fridge-Cam? Genius. My vote for least annoying Celeb on the FN. There you have it. The 6 Least Annoying Food Network Stars. To me. As a footnote, in Amber’s original post, my vote for an annoying star would be Marc Summers. Sure Unwrapped was an informative show, but his cadence and silly puns were ANNOYING! Who do you love or hate on Food Network? I like Alton Brown probably just as much as you do, but there’s a large group of people who find his goofy, quirky style highly annoying, particularly on Good Eats. My wife really hates him. I think Guy Fieri, with his easygoing style, is #1. He seems like the kind on unpretentious guy you could hang out and have a beer with. I know people who hate Alton as well. And I could see having a beer with Guy. He calls into a local radio station often, and they have a blast with him. Guy F is the worst most annoying person on your Food Network. I really don’t know 1 person who can stand his voice and smart aleck ways. I live a large community and belong to several food and wine groups. When he comes on , I for one just turn to another station. I DO LOVE Pioneer Woman, Contessa, Giada, R.Ray, Tyler,Rocco, Bobby Flay, etc.. etc. Alton Brown is the bomb! He’s informative, fun, & quirky. He knows his stuff yet never seems condescending. I don’t get a chance to watch FN often so I dunno if he’s still on there, but I liked Jamie Oliver (a.k.a. the “Naked Chef”) because he had such a nonchalant attitude. Some of his um, cheeky British-ness was a little annoying at times, but I think that’s mostly a cultural difference more than anything. Most annoying? Artificially-perky Rachel Ray is way up on that list! Ugh! I wish they’d give Alton a new show of his own. While I like his banter as MC, I don’t usually watch Iron Chef. Jamie Oliver was likable for sure, but I don’t think they run him anymore. Once upon a time, I really did like Rachel Ray. Her “rise” to fame was a great story. But she’s worn on so many levels… Over exposed too. I like Tyler – he’s good looking, fashion forward, and can cook. He has such a cool way about him it’s like that guy in High School who had all the answers. I used to really like Mario Batelli back when he did his own show. He seemed knowledgeable without the arrogance that comes with many of the elite chefs and he presented his material in an informative way. Alton is definitely my favorite. Great blog. I found it via a search for others who tried Chris Lilly’s dry ribs and was surprised I haven’t come across your blog before since I read many of the same blogs you do. Guy Fieri. At first I thought he was cool, but he is becoming like Rachael Ray..everywhere and over-saturated. He’s on my list of most annoying, but not annoying enough to knock Rachel Ray off the top. He’s on the low end of the list. For least annoying, I agree with this post. Ina and Tyler are on mine as favourites for their easy-going, genuine demeanors, and talents. I personally love Giada De Laurentiis. I mean, come on…she’s stunningly beautiful, charismatic, has a great way of presenting herself and her food, plus she’s full blooded Italian. What more could you want? Giada also has a tendency to be a little much at times and overdone. It seems she’s been toned down a little more which is refreshing. Paula Deen, while endearing and fun at first, has burnt out real fast in my eyes. .-= A post from Jarrett’s blog …Are you thankless? =-. 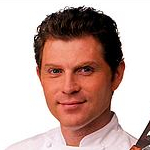 I would have voted Bobby Flay the #1 least annoying myself. While I like Guy Fiery I have seen him annoy a lot of people. On the topic of the Neelys – I agree with you. Are you kidding? 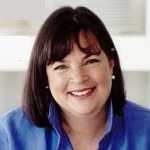 Ina Garten? She raises the bar of snobbery to brand new heights. If you listen to her tone you can easily envision her as a charicature. the neelys are sweet to the point they give me a cavity to0 playful for my tastebuds i want to tell them please get a room then come back an start cooking giada is pretty just like the way she says spigitti instead of down home spaghetti thats annoying to me! I know I’m a little late to the party, but these are good choices. 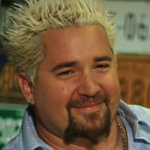 #6 Guy Fieri — In spite of the spiky hair, jewelry, and dorky catchphrases, he still seems humble and genuine. I think having to earn his spot on Next FN Star and spending time with small-town cooks has done him well. #5 Bobby Flay — He can come across as arrogant, but is overall low-key and unlike most other hosts, isn’t a complete phony. In the presence of other chefs, he seems to have a genuine respect for them. 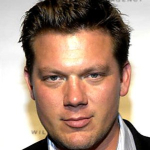 #4 Tyler Florence — I would probably put him on the Annoying list. Tyler’s Ultimate offers some good recipes, but I find him a bit pretentious (e.g. he only cooks with bottled water). He also seems to have a problem cooking and talking at the same time — he usually just repeats the same 3-4 phrases over and over. Check this out, boom, fantastic, absolutely delicious. 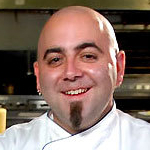 #3 Duff Goldman — I’ve never seen his show. He seems alright. #2 Ina Garten — Sure, she seems a bit pampered and stuffy, but her subdued approach is a nice antidote to all the overbearing “personalities” on the network. #1 Alton Brown — Agree. Good Eats would sometimes over-rely on the skits, but I always liked Alton. His job on the network is to be a know-it-all about food and he manages to do that without coming across as smug or condescending.